What would you if you were suddenly transported to a remote mountainous forest of China? Easy. You'd become a panda. You'd live a gentle life and eat a lot of bamboo and hand out with all your panda friends. With all those perks, we have to ask an all important question. Why would you not just want to be a panda all the time? It might seem like an impossibility really, becoming a panda, but being the costume experts we are, we know that it's not really that much of a stretch. Just get yourself a panda costume! And if you could super size yourself in the process... well... mind blown! Yes, you can, you really can, and all it's going to take is this inflatable panda costume for adults! Because why become a giant panda when you could become a giant giant panda! This supersize costume is made just a windbreaker jumpsuit, but with the battery operated fan, you get "blown-up" to epic proportions! Too cool. Patrol the party looking for sweet shoots of bamboo, or take the opportunity from having a giant panda head on top of your own to take the greatest party pictures ever. 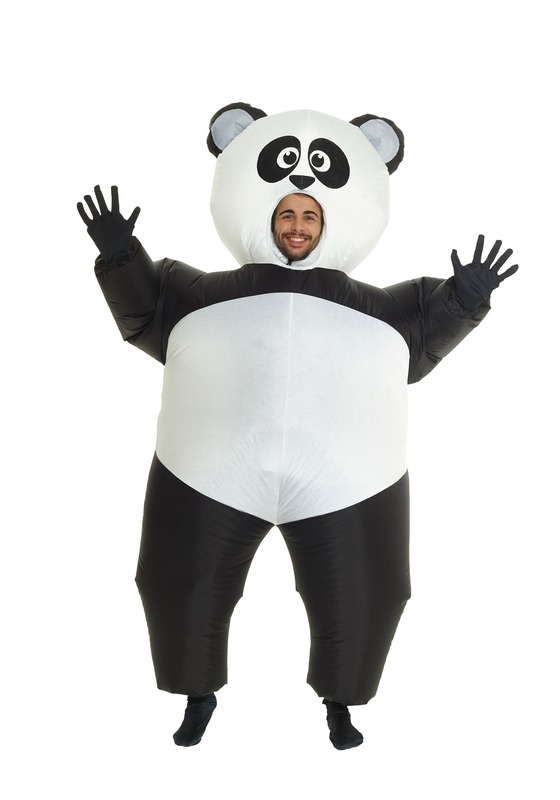 When you choose this inflatable panda costume, the fun will come to you. So go on, and get your Panda on!